If your team's business writing ability is weak, it will impact potential revenue and decrease production. Poor written communication may steer a prospect in another direction. It also means your team will require more time than necessary to complete writing tasks. Poor business writing reflects poorly on an organization. Strong business writing abilities influence others on the team positively; conversely, the opposite is also true. Improving business writing skills will save money and time. If your team's writing is weak, you must correct this. To assess and measure current business writing skills, look at the content and organization (substance) and then the language of the document (syntax). These substance and syntax components go hand-in-hand, but are measured separately. Does the writer display an ability to communicate complex ideas clearly? Can the write extract the significant information? Does the language complement the message? Larger organizations with well-equipped training programs in place may be able to implement business writing training internally. Perhaps this is not the case, or you believe your team will benefit by using an external source. External sources providing training should carefully be reviewed. Look at the trainer's credentials, structure of the training, ability to customize training for your team's specific needs, and flexibility on delivery options closely. These aspects are important in selecting an external training program. Ongoing support provides lasting results. Managers must model strong business writing skills! If your training budget is tight, train your managers first. Their skill will trickle down to their direct reports. Managers will be better equipped to provide guidance for others. Honing in on the critical skill of business writing is an important process during hiring and performance reviews. We recommended meeting with employees and reviewing business writing together. Discuss strengths and weaknesses with them, and provide support to improve weak areas. If you are looking for quick tips it is worth reading our full list of business writing tips. 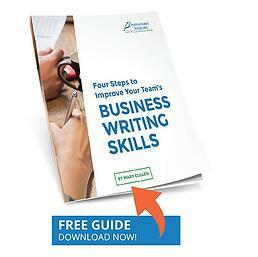 To learn more about effective business writing and how to improve business writing skills, download our guide “Four Steps to improve your Team’s Business Writing Skills” today!